People play Monster Hunter for plenty of reasons. There's the challenge - there aren't many other games out there that give you the same rush as felling a slobbering, explosive-slime-smearing Brachydios after hours of trying. Others might play it for the comforting grind, the amassing of a huge collection of breastplates and swords and bowguns and helmets made out of bits of dead creature. In Japan, most people play socially - high school kids, commuters, brothers and sisters, boyfriends and girlfriends. Me, though? I play it for the monsters. Monster Hunter's beasts are awesome in the literal sense: when you see a terrifyingly aggressive Tigrex or a serpentine, cruel-eyed Lagiacrus or a shadowy, menacing Nargacuga for the first time, there's an intake of breath, a widening of the eyes, even a flutter in the stomach. They are huge, these creatures, and impressive, and above all dangerous. But what's really astonishing about Monster Hunter's monsters is their personalities - the way their nature is evident in their every movement and attack. The Congalala is a big pink gorilla thing that preens and farts and wiggles its bum inbetween raging and swiping at you. The Barioth, a winter dragon crossed with a sabre-toothed tiger, moves with the quickness and ferocity of an apex predator. The Lagiacrus is terrifying in the water and lumbering on land, mean and merciless. They're not just a cool visual design paired with some attack patterns; they look and feel like plausible living creatures. I've always wanted to know where these monsters come from - the process of their design. 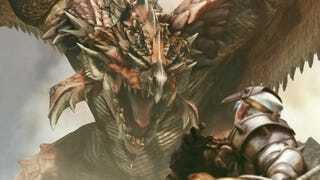 Monster Hunter's mastermind, Ryozo Tsujimoto, who has shepherded this series from PS2 experiment to popular phenomenon over the past decade, tells me that different members of the team have different monster specialties: some are all about the dragons, others prefer a more mammalian style, some specialise in insects. "Each monster has its own team of planners who determine how it's going to move and how it's going to attack and act, and you can see their personalities come through," says Tsujimoto. "They're all going to behave a little differently depending on the team that made them. That doesn't just happen with visual design, but with gameplay design too." For Monster Hunter's designers, it all begins with gameplay design. "The first thing we do is look at overall game design and structure, how it's all going to fit together, and then you start to look at the pieces – what kind of experience you want at certain points, what kind of monster or kind of personality would be necessary to get that experience," says Tsujimoto. "The easy way to do it would be to make all the monsters really cool and powerful-looking, but that's not going to interest the player – that gets boring really fast. So what we do is we divide them into categories: we have creatures you'd see in the beginning of the game, the middle of the game, towards the end of the game, and then there's an extra "special" category. "So we start to slot those in – you don't want a very powerful-looking enemy right at the beginning of the game because it would be silly to be able to defeat him really easily, so earlier on we may want sort of a comical element, where they reel or overreact when they're hit or so on, so that you're not fighting an endless succession of really powerful-looking monsters early on." That "special" category presumably includes the "event" hunts – creatures like the ludicrously gigantic Jhen Mohran, or the Caedeus. The Monster Hunter size chart above (click for the bigger version) shows the ecosystem of the game in all its variation: everything from piddly little raptors to gigantic one-off creatures of legend. Pretty much every single one feels different to fight. "Another thing we keep in mind is a biological plausibility," adds Tsujimoto. "We think about where they appear in the game: if they're in this area, they should be coloured this way, because a real animal would be for camouflage. It should have this body type, because a real animal living here would look that way. We want them to feel as if they could actually be living creatures in their particular habitats." Tsujimoto takes me through the design process for one monster from the upcoming Monster Hunter 4 as an example: the Tetsukabara (he'll have a more Anglicised name soon, presumably), which is basically a giant, armoured, extremely aggressive frog. "A lot of the time you start thinking about the gameplay elements, and the visual design naturally stems from that," he says. "Looking at the example of the Tetsukabara, we knew we wanted him to attack not just directly but through indirect means, like throwing boulders, so that's where those tusks came from – he needed big tusks to scoop up rocks. Most of the time [a monster] comes from a gameplay idea first, and the visuals and the design come after that." "The Tetsukabara is an enemy you fight pretty early on in the game in a cave area – most of the monsters in that cave area are not particularly tough, so we wanted him to stand out. The theme we went with was stubbornness: thick-skinned, hard armour, strong-willed. Those big tusks differentiate him from other enemies, which until that point hadn't been all that powerful – you're supposed to know when you see him that this guy means business. Even the name Tetsukabara is significant – "tetsu" in Japan is a word we use to mean stubbornness. The name suggests he is stubborn in nature." "One other unique aspect of this monster is because you fight him in a cave, we thought it would be cool if he utilised that environment in some way – that's why you see him pick up boulders and pieces of rock, and use them for attack or defense. We hadn't really done something like that before, so we thought it would be an opportunity to bring some environmental interaction to the monsters." I'd always imagined that Capcom's walls were covered with fantastical creatures that never make it into Monster Hunter games, but evidently the process is tighter than that – rather than artists working on monsters and designers then adapting some of those ideas for the game, teams of designers and artists together come up with creatures that fit a purpose. Tsujimoto says that the wastage is actually much less than you might expect. "There are still piles of bad designs that were judged inappropriate," he says. "But one thing to keep in mind too is that there could be times where a particular design wouldn't work for the game we're making, but then we make a new game with new environments and suddenly that idea might work. We never throw anything in the bin permanently." I'm continually amazed by the kinds of creature that Monster Hunter throws at me; it's why I keep playing it. They might have the odd shared attack pattern or familial resemblance, but each of Monster Hunter's beasts is its own challenge, its own separate and believable combination of visual characteristics and behaviour traits and personality. Instead of 100 broadly similar enemies with different skins, I have fought a gold-and-azure leonine Zinogre with electricity rippling through its fur, a blind and poisonous Gigginox whose disgusting, pallid form still makes me shudder on remembrance, a magnificent sea creature a thousand times my size. I remember these fights because I remember the monsters, and all of them demanded something different from me. They are what turn Monster Hunter's battles into stories.